It's officially Spring now but today it's sleeting outside. 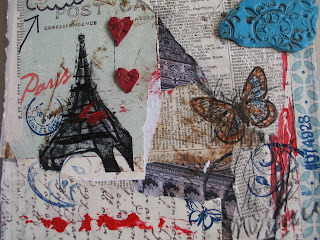 Luckily I have my new and beautiful stamp set, Paris in Love, to focus me on much lovelier things and buoy my spirits! This is the third set Shelley of Singlestone Studios designed for her April 1st release. I LOVE this set. More than any of the other sets this one seems to speak to me. Yes I love the images but I love the way you can look at the images and see a story. As if they are illustrations to some great romance that has yet to be written. There is great music out that will paint a picture in your head while you listen to it. That is the best way I can describe how I feel about this collection of text and images. The rose tossed to the ground, the looming Eiffel Tower in silhouette, the swirl seems like a breeze, the postmark, they all point to a place and a story. Maybe there was a love letter? Maybe some secret assignation between two lovers who's hearts pound as they meet. They don't need to speak, they've written all their thoughts in letters. Now they only whisper little phrases that say nothing but that speak to each heart of a great love. I don't know how Shelley chose the images and text she did for this set but I really do LOVE how it all comes together in my imagination and tells me this story. The first piece of artwork I did with this set is kind of a memory board of this love story that didn't actually happen. 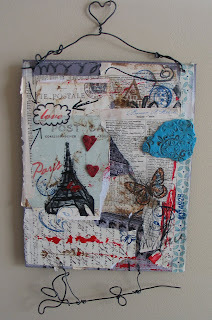 I chose postcard papers and pages from a French-English Dictionary to create the background. Then I added some ink, some paint, and the stamped imagery. I loved the scratched up, mixed media feel of the piece. So I really accentuated that. I added some paper patterned with script that made me think of the love letters I was envisioning. The red acrylic was to add a sense of passion and romance. I think the addition of the wire flower, because of the way it's attached, gave me the sense that this was a sign of sorts. In another form it would have been hanging over the entrance to a cafe but here, it merely points the way to my story of lovers. I really loved how this piece came together and I had a ton of fun creating it. 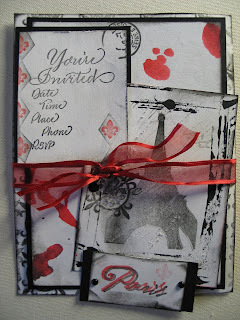 After this piece I thought it would be fun to make an invitation with the stamps. I created some ink blots, and used a credit card in black acrylic to frame the Tower. Then, because I was having waaayy too much fun with this set, I threw together this little clay pendant. Again it has the roughed up aged quality that just screams romance to me. The final project I have in mind I haven't done yet. But can't you just imagine a pair of white undies embellished with red lace and some of these stamped images? I have to try it! When I do I'll post so you can see what I mean. Trust me, it will be sooo cute you're gonna want your own! The Paris set, the Tweet set, and the Butterfly Garden set all go on sale TOMORROW- April 1st! To purchase go to www. singlestonestudios.com! Then when you've done you're own projects I would LOVE to see pics!! LOVE your enthusiasm! Isn't it great to be so inspired and feel that incredibly romantic tug at your heart? Thanks Tonia! I TOTALLY agree!